This bisque is naturally vegan, gluten-free and extra creamy. Wash, dry and slice the red peppers into quarters and discard their seeds. Spread the peppers on the baking sheet and drizzle on the olive oil. Flip them cut side down and roast undisturbed for 25 minutes or until tender and just started to brown. When the peppers are done roasting, use a spatula to get them along with the olive oil and roasting liquids from the baking sheet into the blender. To the blender add in the onion, lemon juice, parsley, cashews, almond milk, salt and pepper, and blend until completely smooth and creamy. Depending on the power of your blender, this could take a few minutes. 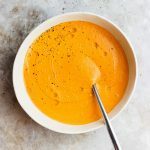 The soup will be hot and ready to serve with another drizzle of olive oil and black pepper. This recipe does not require soaking the raw cashews in advance.